September 24, 2018 – Our time machine welcomes aboard infamous bank robbing-legends Bonnie and Clyde, as they tear a gash across 1930s America at the height of the Great Depression. Returning to ride shotgun with us on this crime spree is Jenni L. Walsh, who we chatted with about her debut novel, the stand-alone origin story Becoming Bonnie . 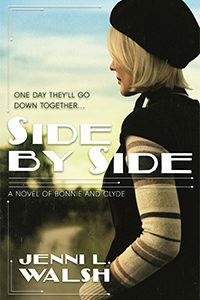 Jenni’s sophomore book isn’t a sequel, but the edge-of-your-seat crime spree work of fiction Side by Side: A Novel of Bonnie and Clyde . In it, we meet a very different couple in a crippled America. Instead of basking in Bonnie’s love, snug in her arms, Clyde is suffering the abuse that helps harden his heart in a Texas prison. Visit our guest at JenniLWalsh.com and follow her @JenniLWalsh on Twitter.